Taxi driver placing post-it note on speed camera. 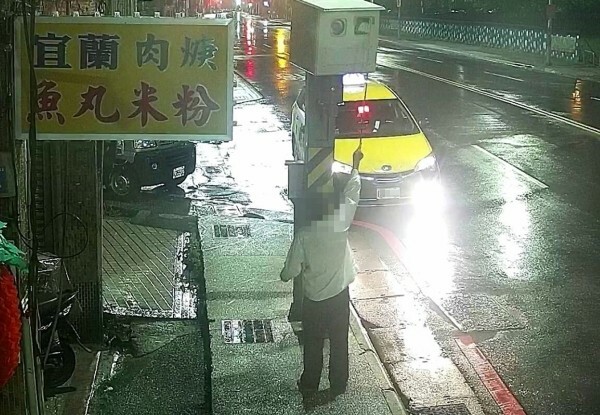 TAIPEI (Taiwan News) -- A taxi driver is being charged with Interference with Public Functions (妨害公務罪), after he was caught on surveillance camera video placing Post-it notes on the lenses of five speed cameras on Nov. 5 in Keelung, Taiwan, reported CNA. The Keelung City Police Bureau today announced that it received a tip-off on Nov. 5 that the lenses of five traffic enforcement cameras on Mingde 2nd Road, Mingde 3rd Road, and Guangming Road had been covered up with paper in an attempt to render the speed measuring equipment inoperable. Police immediately reviewed surveillance footage in the area and traced the vandalism to a taxi driven by the suspect. On Nov. 7, they identified the owner of the taxi to be 55-year-old man surnamed Chueh (闕) and questioned him. Chueh confessed that was in a bad mood because business was slow, and he had already been caught speeding by one of the traffic cameras. At around 3 a.m. on Nov. 5, Chueh said that he used a bamboo pole to stick Post-it notes on the lenses of five speed cameras in an attempt to "blind" them. Wu Chih-chuan (吳誌權) Vice Captain of the Traffic Division of the Keelung Police Department, said the roads where the speed cameras have been installed frequently experience heavy traffic and are prone to accidents. Wu said the purpose of installing the cameras was to remind drivers to reduce their speed to maintain traffic safety. Wu said that photographic equipment used to monitor speeds is a public good. He said that it is illegal to destroy or steal this equipment and appealed to the public to not tamper with these devices, otherwise, they will face criminal charges. 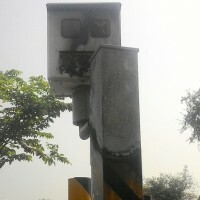 On Oct. 1, a driver in southern Taiwan's Tainan City set fire to a speed camera to get out of a hefty ticket.